This story was originally published in the Courier Journal. Mallory was once a head football manager at the University of Notre Dame. His response was a blank stare. Wide receiver Keelan Cole has since continued to prove Darrell correct and so many others wrong. A Louisville native who didn’t play much as an undersized defensive back at Central High School, Cole is now one game from the Super Bowl. He will play Sunday for the Jacksonville Jaguars in the AFC championship game against the New England Patriots, the latest step in an implausible climb from Kentucky Wesleyan to stardom as a 24-year-old undrafted NFL rookie. 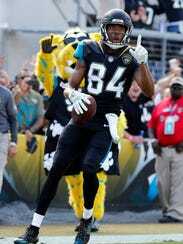 Cole’s 748 receiving yards during the 2017 regular season led Jacksonville’s team, and most of it came in the final month. He caught seven passes for 186 yards against the Houston and then snagged six passes for 108 yards the following week against San Francisco. Such a dramatic rise in production delighted Jaguars fans, observant fantasy football owners and plenty on Kentucky Wesleyan’s campus. They’ve started holding watch parties around Owensboro to celebrate the surprising success of Cole and the Jaguars, who’ve won two playoff games to set up Sunday’s showdown with New England. According to Cole’s father, there was never a time when his son didn’t want to be a football player. This was more than just passion, Morgan explained, but a staunch belief that never dissipated. Not in little league when Cole was usually the smallest player on his team taking on far bigger opponents. Not at Central, when much of his playing time for years came as the holder on kicks. Not when he wasn’t recruited out of high school and ended up at NCAA Division II Kentucky Wesleyan, redshirting his first season because, again, he was too small. Cole was a defensive back for Scroggins’ powerhouse program. Early on, he played mostly in blowouts, once Central had built a big enough lead. He started a handful of games as a senior, Scroggins said, and then missed the rest of the season after suffering a concussion. Cole, who played other sports in high school and initially planned to play baseball in college too, was never viewed as a football recruit. He visited Hanover College in Indiana and then ended up at Kentucky Wesleyan partially because his uncle was the campus minister. He wasn’t necessarily a walk-on because he did receive a small amount of financial aid via scholarship, but “Was Keelan a top recruit for us? No,” said Kentucky Wesleyan coach Brent Holsclaw. But about this time, Cole — who is now listed as 6 feet, 1 inch — grew about five or six inches, his father said. In a way, this was expected. There were tall men in his family, but admittedly, “it happened later than he would have liked,” Morgan said. Still too thin, Cole redshirted his first college season and began adding weight. As a sophomore in 2014, Cole took off. Kentucky Wesleyan’s statistical archive reads as follows for the final three seasons of Cole’s college career: 4,323 receiving yards, 205 receptions and 53 touchdowns. He was consistent, too. He topped 1,300 yards in all three seasons and averaged at least 127.4 receiving yards per game in each of them. It was maybe the second year of that run, during which Cole had a game with 278 yards and five touchdowns, that Holsclaw — a former college quarterback who played at Trinity in Louisville — truly began to realize what he had. Sensing a future in the sport for Cole, Holsclaw began asking around outside the program for advice on how to best market his player to NFL teams. Cole was able to participate in Western Kentucky University’s pro day last year, getting him in front of more NFL teams. Scouts had concerns about Cole’s weight, but there was sincere interest in him as well. By the time the 2017 NFL draft rolled around, Holsclaw said he was hopeful that Cole might get drafted late, maybe in the sixth or seventh round. It didn’t happen, but as soon as the draft ended, teams began calling with free-agent offers. Cole agreed to join the Jaguars on the same day he graduated from Kentucky Wesleyan. But like all undrafted free agents, he was still a longshot to make the team. Jacksonville’s offseason roster reached 90 players in early May. The final active roster before the first game would have 53 players on it. Offseason camps turned into preseason games, and Cole was still there, making plays, earning praise and ultimately making the team. “I really felt like that year he was a senior I had the best player in the state of Kentucky,” Holsclaw said. “The problem is, I’m at Kentucky Wesleyan. I’m not in Lexington. I’m not in Louisville. I’m not in Bowling Green. … I was very confident in his skill set. It was a no-brainer. The key was just getting him in front of people, I felt like, and I know Keelan was confident. His comment to me was, ‘Coach, I just need a chance.’ We were able to get him a chance, and he’s taken full advantage of his opportunity. And I think the people in Jacksonville are smart enough to see that. 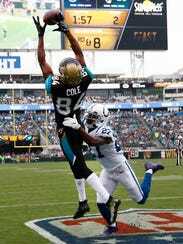 Cole played right away this season, but his role for the Jaguars gradually increased as the season progressed. And as he has emerged, so has his team, going from one of the league’s worst squads in 2016 to Super Bowl contender in 2017. During last weekend’s upset victory over the Pittsburgh Steelers, Cole made highlight reels by jumping between two defenders for a key 45-yard reception. Keelan Cole for 45 yards! Through it all, Cole hasn’t claimed to be doing much special this season. It sounds a bit like a rehearsed line, but those close to Cole suggest otherwise. “There’s a lot of people with talent. But he made it because of the kind of person he is,” Darrell said. “There’s just no question about it. He was the first one in, last one out, the most humble guy. He never big-timed anybody, even though he could have. … I’m more happy for him than I am proud of him because I’m not surprised he’s done it.